Here at “4 Down” we firmly believe in being able to laugh at ourselves. We make many predictions throughout the year, and as with anyone, not all of those predictions are right. We do alright, in our opinion, but there have certainly been some real dud picks from week-to-week. For this weeks 4th and 10, Ross and I will be analyzing each other’s five worst picks for the year. I hope you enjoy laughing at our incompetence as much as we did. Well, at least 3/5 (4/6) of my picks were reasonably close games. Sam on the other hand did what the young folks like to call “pooped the bed” on his 5 worst picks. I’m just glad Ross didn’t go back to my preseason predictions. Woof! Yeah sounds like you’re the one who got manhandled on that one. I couldn’t really distinguish between these two, and truthfully they really weren’t that bad. In both games, Ross picked a tight game (which both were) he just couldn’t hit the winner in either one. You wanna know who did? That’s right…I did. However, Ross was dangerously close to hitting both. TCU blew a 24 point lead in the 4th quarter, and Alabama needed a game-tying FG drive with less than a minute left and no timeouts to send it into OT. This game wasn’t an outlandish pick. Many expected the Tide to roll into Oxford, do their thing and be on their merry way. There wasn’t some crazy score pick. If Sam is going to go for low blows with my “Auburn over Mississippi State pick but I sat in the rain and watched them get beat pick”, I’ll counter with the “Sam sat in his Tide’s archrivals stadium and watched as his team got beat while his rival demolished LSU” game. Ole Miss beat the Tide 23-17, while Auburn beat LSU 41-7. This wasn’t necessarily a terrible pick, either. 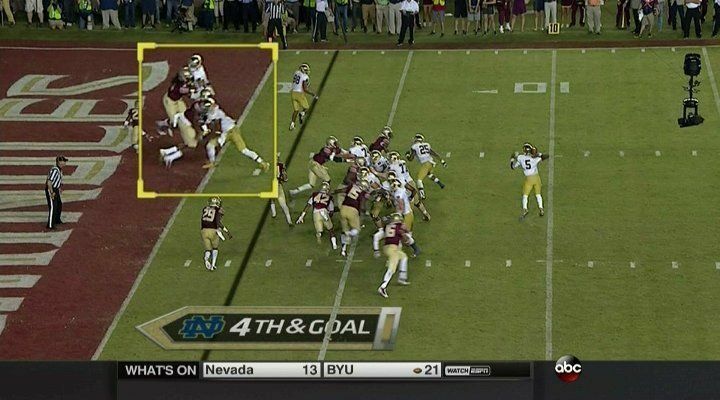 Notre Dame was a terrible pick away from winning this game. For those who didn’t pick up on the pun, Notre Dame had the game-winning touchdown called back due to an offensive pass interference call on a pick play. The main reason this makes the list is because a wrong pick looks even worse than it is when your counterpart picks the exact score of the game correctly. Ross just happened to miss the game that coincided with my best pick of the season. This game is ranked fourth for two reasons. First, obviously the prediction. Ole Pappy here took Big Game Bob 38-10. 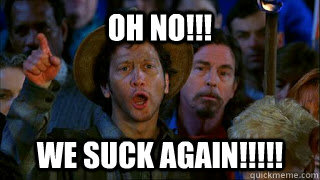 Kansas State won 31-30. Second was the statement “Samaje Perine and Keith Ford are two of the best running back duos in the country, let alone the conference.” They combined for 89 yards (although Ford was out hurt). Still, both reasons land this at #4. I didn’t have to go back that far to find Ross’s 3rd worst pick of the season. Last Saturday, Ross liked the Snydercats to upset TCU in Fort Worth. That didn’t happen. What did happen was Trevone Boykin and company bringing the hammer down Thor-style on K-State and vaulting themselves into the Playoff Committee’s top four. The Horned Frogs won by three touchdowns and outgained the Wildcats by nearly 150 yards. This game and #2 were very close for me, but the deciding factor was the final score of each. Sam opted for the one point upset by the Bruins, and lost big. The Ducks prevailed in a game that was not nearly as close as the score indicated. Oregon won 42-30, but was winning 35-10 going into the fourth quarter. This one hit’s straight to my man’s heart too. Ross thought his alma mater would go into Starkville and handle business. At the time, it seemed like a perfectly reasonable pick (and was). However, two turnovers on their first two offensive plays dug the Tigers in a hole that proved to be too deep to recover from. Admit it, you’re impressed that I got all of the to, two, and toos in that sentence correct aren’t you? As you know, this is the win that launched the Bulldogs to the top of the polls and supplanted Dak Prescott’s name in the He15man race. Ross must have felt miserable sitting in the downpour of Davis-Wade Stadium watching his team lose and his pick be wrong. Sorry boss. Not to name names, cough cough Sam, but someone got a little cocky with this one. Picking the Ole Miss Rebel Black Bear Landsharks to go into Death Valley at night and beat down the vegetarian Bayou Bengals (that’s a Les Miles grass eating joke) 34-7……c’mon man! Not only did Ole Miss not win 34-7, they lost 10-7. The key to this being Sam’s second worst pick thus far was the statement, “If the Tigers can literally run wild on Saturday, then we may be seeing an upset special in Baton Rouge.” Well, the Tigers ran for a wild 114 yards on their way to the win. Ross did pick Auburn to win correctly. However, he didn’t even have the stones to pick his own team to cover at home against an LSU team coming off of a demoralizing defeat. C’mon man! Have a little courage! As it turned out, the Tigers won by 34 in what is still the only college football game I have attended this year. If Sam is going to say that I didn’t have the stones to pick Auburn to cover against LSU, I’m saying the same for this game. With a score prediction of 26-24 (with 2 missed Alabama extra points might I add), the prediction for this one was juuuuussssssttttt a bit off. The Tide rolled 59-0 in an utter beatdown. Some quick math will reveal that that is 57 points off of the final (24 off from A&M’s score and 33 off of Alabama’s. 24+33=57). I, on the other hand, was only 27 points off of the final. (I said 31-24 Auburn. 10 off of Auburn’s score and 17 off of LSU’s. 10+17=27). Therefore if you look at it Sam’s “no stones” game is worse than mine, therefore I’m the winner here.